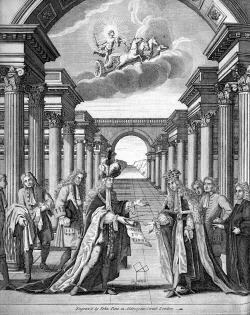 The scene depicts one Grand Master (the Duke of Montagu) passing the scroll of the Constitutions to the next (Philip, Duke of Wharton). Both Grand Masters are supported by their officers. In the background is a depiction of the parting of the Red Sea. Recalling the successful flight of the Israelites from the Egyptians to the promised land. This might signify here the survival of a tradition that had been in danger, but was now entering a time of security. The pillars depict the five orders of architecture introduced to England by Inigo Jones and may also allude to the five monachs who supports the rebuilding of St Paul's Cathedral by Sir Christopher Wren between 1675 and 1708. In the foreground is the Greek word Eureka (Archimedes' famous exclamation "I have found it!") below a representation of the 47th proposition of Euclid, a symbol which is traditionally associated with Past Masters. In the sky directly overhead the sun approaching its meridian height is allegorized in the figure of Apollo Helios, Greek God of the Sun. The overall impression is one of great triumph on many levels: the philosophical and scientific, organizational and traditional, and the spiritual and transcendent. These various elements combine to present Anderson's view of history as the careful unfolding of a divine plan. And to their Offspring did impart. To all descending from his Blood. His curious Learning to dispense. The Art, and Science understood. As ne'er were match'd since Cæsar's Time. The noble Duke of MONTAGU.